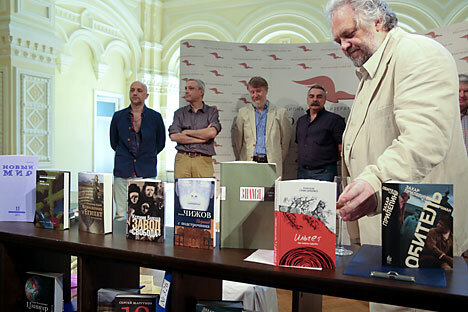 9 books have been shortlisted for “The Big Book,” Russia’s most influential literary award in mainstream prose. Experts are tipping Zakhar Prilepin’s “Cloister” as the favorite to win the prize. This history of the ancient monastery of Solovki, which was turned into a prison in the 1920s, is told from the point of view of a young man who ended up there for an accidental murder. “In this novel, Prilepin has reached new heights in terms of his writing and understanding of life,” says Mikhail Butov, chairman of “The Big Book” prize’s board of experts. Kseniya Buksha’s novel “The Svoboda Factory” is also set in the 1920s and depicts that initial period of the Soviet state’s development through the eyes of employees at a defense plant. The book is based on the author’s interviews with workers at a St Petersburg plant and even contains their direct speech. Yet it is a work of fiction in the now almost forgotten “industrial novel” genre. A similar method is used by Svetlana Aleksiyevich, who was tipped for the Nobel Prize in Literature in 2013 and has received numerous awards, including the Herder and Remarque prizes. Her novel “Time Second-Hand” uses different voices to tell the story of Soviet life, which did not end with the breakup of the USSR. This is a documentary text made up of first-hand accounts, confessions, interviews and dinner discussions. “Literature can be like that too. Aleksiyevich’s books can teach you the history of our country better than any history textbook,” Butov points out. Readers will be equally challenged by Aleksey Makushinsky's “Boat for Argentina,” written in the tradition of European modernism. Makushinsky is the son of the Soviet writer Anatoly Rybakov, who was a victim of Stalin-era reprisals. In the novel, Russian history is intertwined with European history, while Makushinsky can compete with Proust in terms of the complexity of his language – and is just as difficult to translate. An alternative history of Russia is a favorite theme in Vladimir Sorokin’s works. His “Telluria” is a dystopian tale of Russia plunged back into an age of warring fiefdoms. Sorokin is a master of style, and in this work he has written each of its 50 parts in language reflecting the different mentalities of the citizens in his imaginary future Russia. Despite all the variety offered by the 2014 shortlist, Mikhail Butov points out that this year, perhaps for the first time, he can answer journalists’ favorite question: would it be fair to say that there is a specific trend in this year's literature? “It would!” he replies.